LABOR-SAVING & SHARP: this garden pruner adopts the high-quality stainless steel spring with shock-absorbing performance, which can reduce the impact after cutting. SAFETY LOCK : easy to operate. 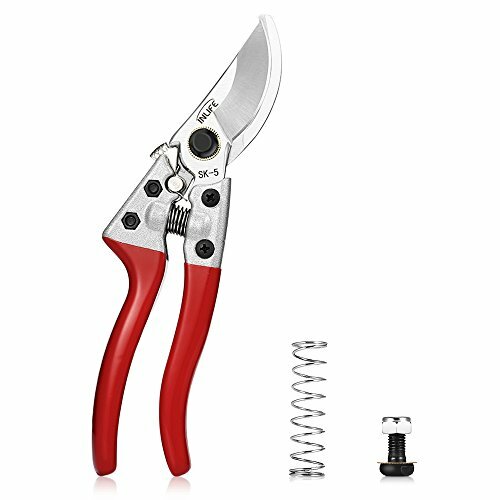 The pruner shears is designed with auto safety lock. The blades are closed together when you don't use it, pretty safe to use. SUPERIOR QUALITY BLADES:　The 6 cm blade is made of SK-5 steel with the performance of wear-resistance and sharpness, which can cut kinds of branches easily. COMFORTABLE HANDLE: The aluminum alloy handle is equipped with PVC plastic sleeve, which is not only comfortable to handle but also can effectively reduce hand fatigue and wrist strain. MULTI-PURPOSE: the pruning shears are designed for gardening , trees. Also can be wisely used for harvesting fruit, pruning branch and so on. If any questions, please message us. If you have any questions about this product by DAMAIFENG, contact us by completing and submitting the form below. If you are looking for a specif part number, please include it with your message.